TT #55 Is it time for a baby Bounder? Is it time for a baby Bounder? Recently, I had a discussion with a close friend about the decision he and his wife had made to sell a beautiful trailer in a well-managed park and begin travelling in a new motorhome. His question is what should I buy? When someone presents me with this question, I recommend a Bounder without reservation. It was clear to me that they were not going to buy a Bounder even though it was within their budget. A Bounder would provide them with many of the features that they were seeking however, there was something missing. They bought and returned a type B+ within a couple of weeks because of various design and quality defects, then struggled with what to replace it. Ultimately it was another competitor's B+. Our discussions led me to ask the questions: Where is the market heading and What were they really seeking? Add to that the facts that we have entered a market with limited and higher priced fuel, and that they both are working and will be for another ten years. Of course I heard the venerable "Maybe in five years I'll by a new Type A coach like your Bounder" - How many of us have heard that over the years? I mentally reviewed the positives: They could afford to buy a Coach, They wanted to travel, even if only on weekends and holidays, they wanted all of the usual amenities: a slide out, microwave oven, LCD TVs and Home Theatre, a functional kitchen, a usable bathroom with shower and a comfortable bedroom. It had to be easy to drive and "I want higher build quality, like my cars (" both American made Japanese models), something easy to service and store, and it has to look good " look at the full body paint and the chrome grille!!" Sounds pretty generic and typical of most modern RV's. Missing from the list was items like: lots of storage, a generator, large capacity tanks, lots of carrying capacity and a diesel engine (a $10,000 upgrade). Size was an issue and in the interim period between returning the first and buying the second they had taken a European vacation. "Why can't they make RV's as functional and efficient as the Europeans?" was a typical question upon their return. So what can the US RV industry do to profitably capture more of those buyers? First I would have the engineers and major decision makers drive hybrid cars. Let them get over some of their preconceived ideas and observe how an integrated system can deliver fuel economy. Observe that the multiplicity of driver instrumentation shows that even on the highway there are considerable times when the alternative electric power source is utilized. Look at how the detailed aerodynamics clear the rain and snow off the exposed surfaces while driving. Even little things like the shipping tie-down hooks are angled for less resistance. These engineers worked with wheelwell design to lessen air entrapment and wind resistance, added energy saving tires, used smaller engines augmented with an electric motor and allowed the powertrain to be computer controlled. Even pressing the Start (Power) button on a hybrid car does not start the engine, a computer does so, as the need arises. Smaller does not mean small. I drive a Toyota Camry Hybrid which is a far larger and heavier car and at least two categories larger than the similar 1984 model I once owned. Fuel economy is at least 50% better (43 MPG US) Secondly, given that many chassis makers are working closely with RV makers, let's encourage this trend. Quality of product can only increase as there is more synergy between the body builders and the chassis makers. So what would a Baby Bounder look like? Integration, smaller, high quality, efficiency and lighter weight would be the touchstones of design. It would be 26-30 feet in length with a longer wheelbase, and less overhang than on previous iterations of these coach lengths.. It would have single energy saving rear tires. It would be lower in height, slightly narrower, contain two slideouts, and be rear powered so that the space occupied by the driveline could be incorporated into the underfloor storage. Target fuel economy would be 15-18 mpg under ideal conditions with targets to improve this with each redesign. Driver information systems would focus the RVer on economy of operation and provide a plethora of methods to understand what actual performance is being attained. Electric power steering and brake assist would be standard and the heating and air conditioning systems would be coach items not engine driven I envision a purpose built integrated heating and air conditioning system that might use engine coolant to provide heat when on the road and electricity when parked. All appliances would be Energy Star qualified and all electric eliminating the need for a propane system. Water heaters would be instant heat styles. An inverter/charger and battery system would provide most of the coach power with supplementary solar panels for additional charging ability. A small, high output, fuel efficient, quiet generator would be an option. Glass would be double paned, glued inplace and coated for energy efficiency. Roof panels would be white fiberglass reinforced plastic (FRP) for heat reflection. Body technology will strive towards higher strength, laminated and insulated designs and full body paint will be standard.. Interior components would be better designed for this specific purpose with low weight, suitably sized and high functionality being the catchwords. Entertainment systems would be totally integrated with electronic controls in the bedroom and living areas. Is there really any logic to having separate components with multiple power supplies when a single source could power and integrate all functions? Life cycles of these Baby Bounders will be longer since owners will be retaining them longer. This Baby Bounder will not be much cheaper than today's models although in the long term there will be economies of scale in higher efficiency that Fleetwood and the new RV buyer will share. Since prices will continue to escalate RVer's will be looking for better fit and finish with higher quality, longer lasting.materials and better styling both inside and out. The trend in type B and B+ coaches is toward better integration and more car like features. Type A and C RV's will out of necessity need to move in this direction. 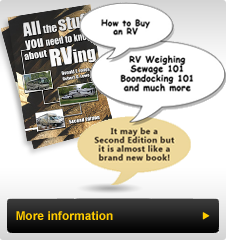 RV dealers will need to catch up to their car selling brothers and sisters. Just as in the car business dealers will close, merge or fail. Given the economics it is likely that the RV business will see contraction in the number of brands available and dealers will, out of necessity, be required to have more professional and qualified technicians to deal with the integrated systems. RVs will move from using off the shelf components to integrated design and the industry will need to train personnel to react to these changes. So what do you think? Is there room for a Baby Bounder? Do the principles outlined here resonate with you? Would you buy one if Fleetwood designed and built it? What would you recommend if you could pass along your suggestions? Who knows perhaps a Baby Bounder is your future. Better still: Is it in your neighbor's future as well?